Fife Flyers 1974: Jack Latto, Jimmy bell; (assistant) John Taylor, Dougie Latto, Alex Churchill, Kenny Horne, Angus Cargill, Lawrie Lovell, Jimmy Jack, Moe McIntosh, Harry Cottrell (trainer). Front: Gordon Latto, Jimmy Hunter, Willie Cottrell, John Pullar, Norrie Boreham, Les Lovell, Chic Cottrell. 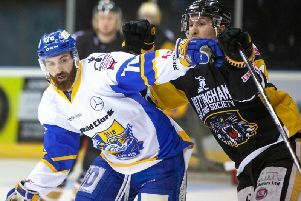 There are few, if any, UK ice hockey teams, which can match Fife Flyers when it comes to giving local players an opportunity to lace up and play. Over the decades, the club has unearthed a conveyor belt of outstanding players who have gone on to skate at the highest level. Fife Flyers 1974 - Les Lovell scores in a 10-4 win over Glasgow Dynamos. Jimmy Mitchell and Bert Smith were the first Kirkcaldy boys to break from the junior ranks post-war, and countless others have followed in their tracks. The sport in the 1970s was kept alive by the commitment of local players – from Fife to Durham, Whitley, Ayr and Paisley – who remain incredibly proud of turning out for their home town team. Season 1974-75 was a year of change for Flyers, and one that produced a free-scoring team. Pep Young had stood down as coach to focus on his business commitments, handing the baton on to Lawrie Lovell, making his debut in the role of player-coach. Young had laid strong foundations, turning Flyers into the strongest side in the Northern Ice Hockey Association (NIHA) since the start of the decade. Club stalwart Joe McIntosh returned, John Pullar took over as netminder, and a young Jimmy Jack earned his call-up from Kestrels to join a forward line which also included Chic Cottrell, former Rookie of the Year, and the Latto brothers, Dougie and Gordon. Add in Kenny Horne, Gus Cargill, Jimmy Hunter, Norrie Boreham, Les Lovell, Alex Churchill, and John Taylor and you had a team that was made in Fife. Flyers started the season going down 7-4 to Dundee Rockets in an Autumn Cuop tie which drew a good crowd, and they posted their first win with a 9-5 victory over Glasgow Dynamos in October. It was an end to end match which saw Flyers rally from 3-1 down as Les Lovell bagged a hat-trick. They then began their season long torment of Durham Wasps, nailing them 10-7 to maintain a sequence of double-figure wins over the big blue machine in Kirkcaldy which stretched back some six seasons. It was a night when the goals came freely - the scoreboard going from 2-1 to 4-2 inside 60 seconds! The game also marked Jimmy Jack’s first goal of the season, while Les Lovell netted four,m and Johnson for Wasps hit five, and still lost out! Up to Dundee and another big win – this time 12-4 victory which was Rockets’ worst home defeat. They scored first too, but Les Lovell and Taylor bagged nine between them. Flyers then netted ten in the return against Rockets, and against Murrayfield Racers only to see a five-game winning streak snapped as Whitley Warriors came to town and claimed a 6-3 victory. beaten record on home ice. The clock showed 58:58 when Whitley tied the game up through Miller at 6-6. A new year, 1975, dawned with defeat at home to Ayr Bruins in front of the lowest crowd of the season, and a visit from Dutch side, Utrecht Hunters - the first continental team to come to Scotland in a decade. The goals continued to pour in - Les Lovell 5+4 and Law Lovell 4+4 in a 13-5 rout of Paisley followed by a 15-6 scalping - Mohawks hadn’t won pn Fif ice for six seasons, and ;’74-75 brought little respite - plus ; another 10-gial demolition of Durham. Glasgow Dynamos, coached by ex-Fifer Joe Baird, suffered too, going down 10-4. But there were defeats too including a hefty 11-2 loss at home to Whitley Warriors amid some controversy. Flyers took 52 of the 69 PIms dished out by referee Van Horne who had to be escorted off the ice at full-time. Kenny Horne took a ten-minute misconduct penalty before then fighting with Kenny Matthews – they had to be separated by players and officials as things kicked off. A 6-3 win over Murrayfield Racers blew the league title race wide open, and a hat-trick from Dougie Latto in an 8-3 victory over Dundee Rockets too Flyers into the Spring Cup play-offs. Their Icy smith Cup hopes, however, were ended as they went down 6-5 to Murrayfield – they held a first leg lead but coughed five goals without reply as their old rivals claimed the spoils. Racers also denied Flyers silverware as they retained the Skol Cup, winning 6-5. Flyers got some revenge with an 8-5 win over Racers in the first round of the Edinburgh Evening News Trophy, to stand a good chance of making the final - that honour went to the team with the best result against the Riverside team. By the time that game took place in mid-May, Flyers had gone three weeks with no home ice and managed just one training sessions. Little wonder they went down to an 11-4 defeat with Wood netting seven.